Seen around Arley today, steam locos 4936, 7802, 7812 & 42968. D8188 was on the diesel turn but only completed one round trip. 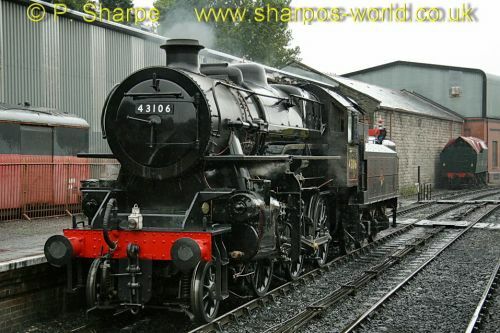 This entry was posted in Severn Valley Railway on August 31, 2009 by Sharpo. Steam locos seen around Arley were 4936, 7802, 7812 & 42968. D444 was on the diesel turn, but I heard it was replaced by 37906 for the second round trip, but the 37 failed after Bewdley on the outward trip. Photos already uploaded, see previous post for link. 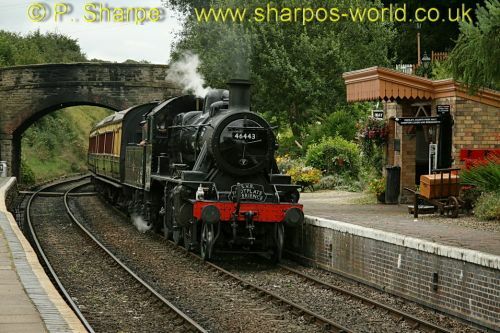 This entry was posted in Severn Valley Railway on August 30, 2009 by Sharpo. A few more photos added to the current SVR album. It’s not easy getting “different” photos each weekend, going to the same station, but I try! At least it’s a “family” outing & KC gets her walk. No decent photo of 4936 today, only saw it passing tender first at Arley. This entry was posted in Sharpo's World Photo Updates on August 30, 2009 by Sharpo. Rather a dull day, but at least it was dry. 4936 & 7812 seen on trains as we walked KC. At Arley, 46443 was on Footplate Experience, crossing with D1062 on the diesel turn. 4936 returned with a train from Kidderminster, then we headed back to the car but saw 7802 on the train from Bridgnorth in the distance. 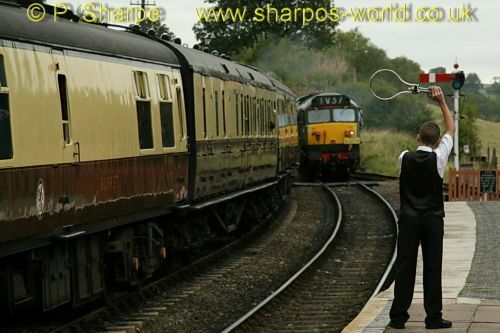 This entry was posted in Severn Valley Railway on August 29, 2009 by Sharpo. Just a few photos from today. D1062 was working the diesel turn, the other locos photographed were 4936 & 7812. Margaret & KC also feature in 1 photo. The photos are added to the “July to September” album, but the link below will just show the 9 from today. This entry was posted in Sharpo's World Photo Updates on August 29, 2009 by Sharpo. 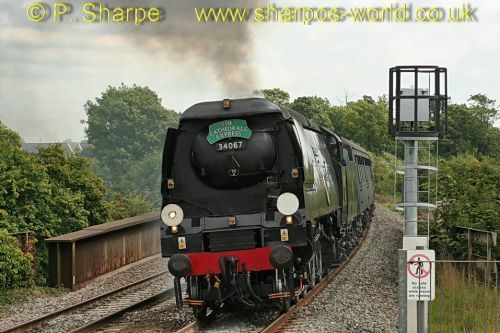 I went to Warwick Parkway to see 34067 Tangmere on The Cathedrals Express, all the photos are in my main Sharpo’s World site but I have included 3 here. A couple of hours later one of the Colas 47s was due through on the Burton to Dollands Moor working. As usual, I take photos of most of the trains passing through, which of course include the usual DMUs, but 3 other freights were also seen as I waited. This entry was posted in Sharpo's World Photo Updates on August 28, 2009 by Sharpo. Not many choices of where to see the train when travelling by rail to see it. Having been to Leamington for steam specials, I felt like a change. Checking train times I could get to Warwick Parkway about 10 minutes before the steam special was due, so that was the plan. This entry was posted in Sharpo's World Photo Updates on August 27, 2009 by Sharpo. Update 173. Ivatt 2-6-0 43106 “Flying Pig” back in action at Bridgnorth on the SVR. Earlier this week, following a major overhaul, 43106 made a test run to Hampton Loade. Just as a change from “lunch at Bewdley”, we went to Bridgnorth for lunch. The loco was in steam in the yard & I managed some photos from the footbridge and platform. Later on, as we were browsing in the bookshop, a whistle was heard & I rushed out just in time to photograph the loco as it headed away from the yard. Fortunately it only ran as far as the signals beyond the road bridge & ran back to platform 2. I guessed it would wait for the arrival of the next train before another run towards Hampton Loade – and that was what happened. This entry was posted in Sharpo's World Photo Updates on August 26, 2009 by Sharpo. Took youngest grandson on the train today. 11.40 off Kidderminster hauled by 7802, crossed with 7714 at Bewdley. Went to Engine House at Highley for lunch and to see the locos there. 42968 passed by with a train from Bridgnorth. 7802 took us back to Kidderminster, where we finished off the day with 2 rides on the Coalyard Railway! 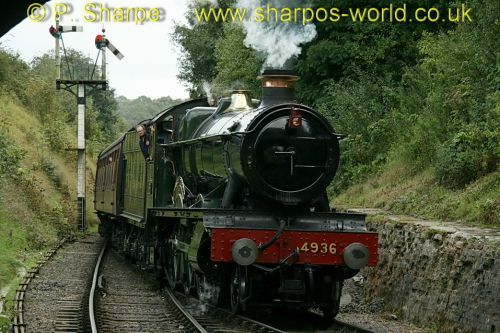 This entry was posted in Severn Valley Railway on August 25, 2009 by Sharpo. Yes, it’s taken 3½ years since the gallery was started in January 2006 for the counter to go over the million mark. Could probably have done it sooner if I’d plugged my photos more often in forums & e-groups, or even kept up to date with uploading photos – but what does it matter! Let’s hope that one day I reach the 2 million mark, and beyond……. 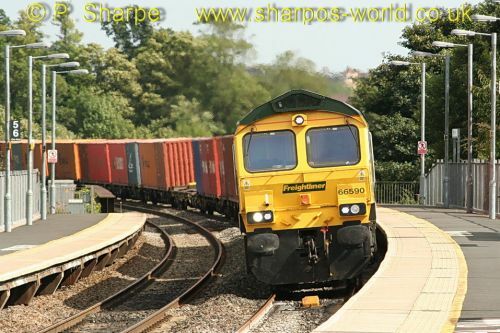 This entry was posted in Sharpo's World gallery on August 24, 2009 by Sharpo. Update 172. 47501 & 47802 on 1Z47 Rail Blue Charters, Chesterfield to Paignton tour. Rarely see DRS 47s so this was worth a trip to Bromsgrove. The freight working was a bonus, totally unexpected! I believe one of the 47s was failed at Exeter and the special returned behind a single 47, bet that sounded good on the Lickey! This entry was posted in Sharpo's World Photo Updates on August 24, 2009 by Sharpo. Update 171. More photos for the summer SVR gallery. As usual, way behind with photos. Just recently though, I have been adding more photos to the “July – September” album. Nothing exceptional, just the usual scenes at Arley or Bewdley, but with the addition of the visitor – 4936 “Kinlet Hall”. Don’t ask me why, but the photos are being added in backwards order, that is most recent first. I’m also making an effort to ensure they are also linked to the other SVR albums by location etc. Bit time consuming, but hopefully worth it in the long term. Link to the “July to September” album which will continue to grow over the next few weeks. This entry was posted in Sharpo's World Photo Updates, Uncategorized on August 23, 2009 by Sharpo.